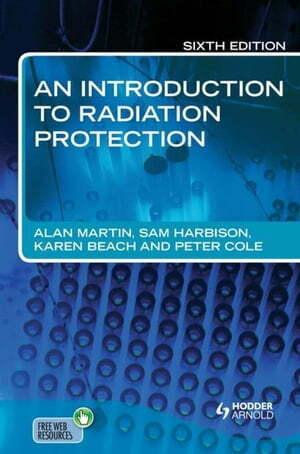 Collins Booksellers - An Introduction to Radiation Protection 6E by Martin, Alan, 9781444146080. Buy this book online. An Introduction to Radiation Protection is a highly readable account of the nature of the hazards presented by ionizing radiation and the methods of protection for those new to the field and for the non-specialist. The sixth edition of this established text takes readers through the general background of the subject, the technical principles underlying the control of radiation hazards, radiation detection and measurement, and the biological effects of radiation. These principles are followed by a consideration of radiation protection issues in the nuclear industry, the non-nuclear sector, and the medical field. Further specialised topics include risk assessment, waste management and decommissioning, radiological incidents and emergencies, relevant legislation, and organizational issues. Supplemented by clear diagrams and photographs, summary sections, and revision questions, the book is suitable for the beginner as well as the more advanced radiation practitioner. It remains an ideal primer for those working in the nuclear industry, nuclear medicine technicians, radiographers and medical physics technicians, health and safety executives and occupational health professionals. It is also an invaluable companion for anyone training or undertaking a course in radiation protection.